As a Private Wealth Advisor, Jevin Ferguson works with a select number of highly successful individuals and families, many of whom have sold a business, taken a business public, attained a new level of professional success or undergone a family transition. Regardless of the source of wealth, Jevin leverages the global reach and resources of Morgan Stanley to bring thoughtful solutions to address the financial needs of his clients and their families. 2018. 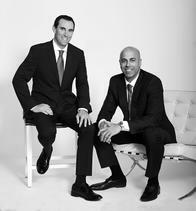 Jevin also served as Vice President for Smith Barney in Newport Beach, CA. Jevin received his B.S. from the University of Utah. Outside of work, Jevin coaches his son's Pop Warner football team. He is an eagle scout and loves to surf, snow ski and travel. Jevin and his wife Nicole live in San Clemente, CA with their four children. With nearly 20 years of experience providing comprehensive solutions for a select group of clients, Daniel Marks delivers highly personalized portfolio management, wealth planning and access to lending strategies to individuals and families. Clients appreciate Daniel's attention to detail and familiarity with complex option and hedging strategies. In addition, Daniel works with entrepreneurs and private business owners. Through his association with Morgan Stanley Wealth Management , he helps clients grow their businesses, manage corporate cash flow, set up employee benefit plans and prepare for the sale or transfer of their company. Through comprehensive planning and sophisticated investment strategies, he helps founders preserve their newly acquired wealth. Daniel began his career at Morgan Stanley and later joined Smith Barney. He moved with his team to UBS in 2009. Daniel earned a B.S. degree in business from the Entrepreneur Program at the University of Southern California. He and his wife, Falan, have two children, Francesca and Cody. California State University- Long Beach and earned a B.S. degree in finance. Jennifer, and daughter, Laura. He enjoys running, playing baseball and traveling. Stanley, she worked at UBS and RBC in a similar role and with Roth Capital in compliance. coaching her daughter’s soccer team.